Some hours ago, a security vulnerability became public regarding services of Cloudfare. 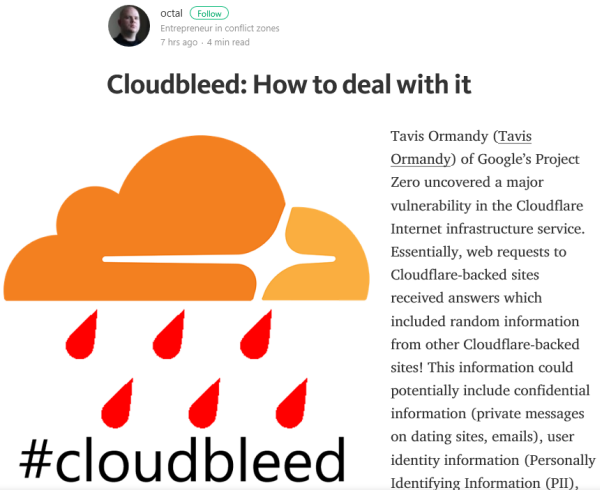 Read this article “Cloudbleed” and strengthen your IT-security! “Cloudfare Inc. is a U.S. company that provides a content delivery network, Internet security services and distributed domain name server services, sitting between the visitor and the Cloudflare user's hosting provider, acting as a reverse proxy for websites.” see Wikipedia. A lot of Internet companies are using Cloudfare for the distribution of their content. This includes services as Zendesk, Uber, stackoverflow.com, medium.com, yelp.com, localbitcoins.com and about 10,000 more sites. I didn’t see sites as Microsoft, Apple, Amazon or Google included in that list, but a lot of other popular services.